The Association of Illustrators presents The World Illustration Awards 2018. 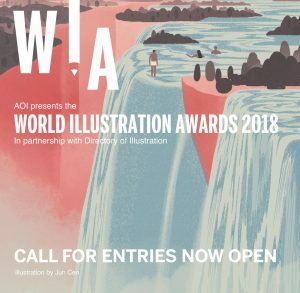 The World Illustration Awards 2018 call for entries is now open! The deadline for submissions is Tuesday 6 February 2018. Illustrators in any country working in any medium or context can enter work created between January 2017 and February 2018. Submissions can be made into eight categories as either a New Talent (students or those within 2 years of graduation or entering the illustration world) or as a Professional entry. Work may be entered by the creator or third parties such as agents, colleges or commissioners. Selected entries will be promoted across our extensive industry networks as soon as they come in. All shortlisted and winning entries will be presented in a high-profile exhibition at Somerset House, London held in June 2018. All shortlisted entries have the opportunity to be selected for a touring exhibition which receives over 40,000 visitors every year.